Media Release: Experts warn Tripa orangutan extinction imminent. Legal action needed NOW! Today a scathing report was delivered by a panel of experts to an international press audience issuing an urgent appeal for Indonesian courts to uphold national laws following an explosion of recent fire hotspots throughout the protected Tripa peat swamps, an area hosting among the highest densities of orangutans anywhere on earth. Dr Ian Singleton of the Sumatran Orangutan Conservation Programme warned the international press gallery that the population of Sumatran orangutans in the Tripa peat swamps, a UNEP/UNESCO Great Ape Survival Partnership priority site for Great Ape Conservation, is in immediate jeopardy, and unless the current wave of destruction can be halted is likely to be exterminated before the end of the year. “The population in Tripa is considered to have been around 3,000 individuals in the early 90’s but there are probably less than 200 hanging on there today, of a global population of just 6,600, and many are already fleeing the fires, along with many other wildlife species. At this rate Tripa’s orangutan population will be locally extinct by the end of 2012”, said Dr. Singleton. “It is no longer several years away, but just a few months or even weeks before this iconic creature disappears from the Tripa swamps forever” he continued. Ironically, any that are captured and kept illegally as pets during this process will be the ‘lucky’ ones, the survivors, but they will be refugees from a forest that no longer exists. The other’s will simply die, either directly in the fires, killed by people, or of gradual starvation and malnutrition as their food resources disappear. We are currently watching a global tragedy. 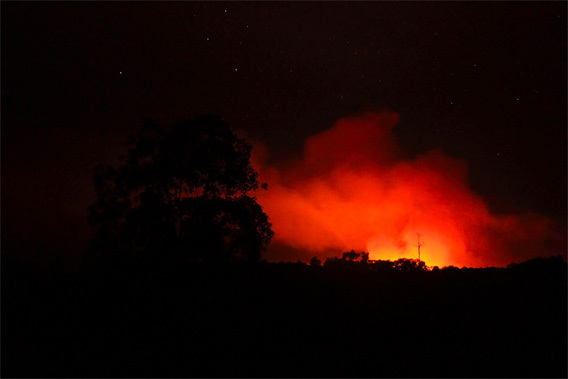 The audience was shown satellite imagery of the firestorm that is sweeping across Tripa’s protected forests. Local sources have also spoken to some of the plantation workers contracted to clear the forests where most of the fires are occurring. According to them they were instructed not to do such a thorough job of clearing the vegetation as it was all going to be burned anyway, strongly suggesting a premeditated and very deliberate contravention of laws that forbid the use of fires for land clearance in peatlands. A spatial planning expert from the University of North Sumatra, Mr Riswan Zen, explained how he had learned from colleagues who revised the map indicating areas of forests and peatlands protected from new permits, in accordance with the president’s own moratorium, that after the first version of the map, numerous companies, including Kallista Alam, had lobbied for the exclusion of their concessions from the ‘off-limits’ areas. They told him that staff of the National Land Agency appeared with a GIS map of the Kallista Alam concession and told the mapping team to remove it from its existing protected status, even though the concession permit was issued 3 months after the moratorium map was first issued. Riswan questioned why there was no documentation or evidence provided for the concession’s sudden exclusion from protection, and recommended that any future revisions should be accompanied by explanations, with clear and transparent documentation of changes. Despite assurances in December from the Ministry’s Secretary-General of Forestry that the protected status of the area would be reinstated as a protected area, this has not been followed up, and the evidence presented by the experts clearly shows that the Tripa Peat Swamps are now on the verge of disaster. A lawyer acting on behalf of the Coalition for the Protection of the Tripa Peat Swamps, Kamaruddin, explained how local community representatives on November 23, 2011 reported the issuing of the new PT Kallista Alam license as breaking national spatial planning laws, to the National Police in Jakarta. The head of the Police’s investigation unit subsequently issued a letter stating that the case did indeed merit a criminal investigation, but then contacted the Aceh Provincial Police, asking them to follow the case up. Since that letter was sent, the Aceh Police have taken no action whatsoever. The head of the National Police was invited to the conference to respond to these statements, but no response was provided. Walhi Aceh Executive Director, TM Zulfiker, earlier outlined an additional legal case currently being heard concerning the same concession, which will climax in the much anticipated final judges verdict in the Banda Aceh courtroom on April 3rd. TM Zulfikar described this legal action as being a very straightforward, ‘black and white’ case. A concession was clearly issued inside the Leuser Ecosystem, designated a National Strategic Area for Environmental Protection in the National Spatial Plan, established with Government Regulation 26 in 2008. Furthermore, forest clearance and canal construction actually began in this concession long before the permit was even granted, and it was actually granted whilst clearly shown as off limits to any new plantations under the official map of the President’s moratorium on new permits in primary forests and peatlands noted above, before its mysterious removal from the revised version of the map in November 2012. President SBY was invited to the conference today to clarify his position and explain whether he is still committed to the multi billion-dollar emissions reduction agreement with Norway, and the upholding of Indonesian Law. Teguh Surya, climate justice specialist with Walhi (Friends of the Earth Indonesia), stated that it is imperative that the judges in the above legal case reach a fair and just decision and that the Kallista Alam permit be immediately cancelled. He also expressed that the Norwegian government must have the courage to insist that an independent and transparent team is established to monitor the implementation of the Government’s letter of intent and investigate the suspicious amendments to the moratorium map that removed the Kallista Alam concession from the area ‘off limits’. He also proposed that the existing moratorium on new permits should not be for a limited period only, and should include provisions for much improved governance of the palm oil industry, leading to more transparency, enhanced law enforcement and social accountability. The general consensus was that the situation of the Tripa Peat Swamps and their orangutan population is now so critical that only immediate action will save them. The presenters stressed that there is still hope if only Indonesia would enforce its own laws, and issued a strong list of demands to this end (see following). The pace of destruction of the Tripa peat swamps in Aceh has escalated dramatically in the last few weeks, possibly as the companies take advantage of Aceh’s status as having an “interim’ Governor. We are extremely alarmed that if the current pace of destruction is allowed to continue, there will be no HCVF forest and no more Critically Endangered Sumatran orangutan, or any other protected wildlife, in Tripa by the end of 2012. The loss of Tripa’s remaining HCVF forests will also result in dire long term environmental consequences for the region’s human population, with ever increasing incidences of serious flooding and drought due the complete loss of critical hydrological and other ecosystem functions previously provided by the peat swamps. Satellite imagery from December 26th, 2011, clearly shows less than 13,000 ha of Tripa’s former 60,000 ha of forest remained at that time. Moreover, much of the forest was already highly fragmented, with the largest remaining block measuring less than 8,400 ha, and only one other remaining block covering more than 1,000 ha. Since then, more recent land clearing for oil palm and the widespread use of fire has reduced the forest cover even further. From 2009 to 2011 over 5,000 ha of peat swamp forest was completely destroyed. This means that circa 100 Sumatran orangutans also perished, either killed directly in the conversion process or currently dying long lingering deaths due to starvation and malnutrition. A few “lucky” survivors of this process are probably also still being kept as illegal pets in the vicinity and several have already been confiscated by the authorities. Right now the forest is being destroyed even faster. Between the 20th and 24thof March this year, just 5 days, there were no less than 87 fire hotspots, meaning major fires detectable by satellite, in 3 of Tripa’s oil palm concessions; PT SPS2, (formerly PT Astra Agro Lestari), PT Kallista Alam (a company currently on trial for legal infringements), and PT Dua Perkasa Alam. Such a high number of hotspots in so short a time (5 days) represents the highest intensity of fire hotspots recorded in a 5-day period in Tripa since satellite monitoring of Indonesia’s fire hot spots began in late 2000, higher even than the infamous fires in the PT Kallista Alam concession in 2009. The overall area of land devastated so far by these latest fires alone is at least 2,800 ha. What is more, by far the majority of these hotspots occurred on the deepest peat within Tripa, where numerous peat depth measurements have recorded well over 5 metres. The number of Sumatran orangutans, Sumatran tigers, Malayan sun bears and other endangered and protected wildlife, many of which are peat swamp specialist species found in no other habitat type, that have perished in these fires is immeasurable. Nevertheless, based on knowledge of orangutan densities in Tripa and other peat swamp areas on the west coast of Aceh, it is estimated that the number killed in recent months must be at least approaching 100, if not even more. With the continued encroachment and draining of the remaining forests, we are now in a situation where a prolonged dry period and further indiscriminate burning could easily spread quickly through the whole of Tripa’s remaining forest in just a matter of weeks, or even days, completely eliminating the remaining wildlife, including the last couple of hundred orangutans. 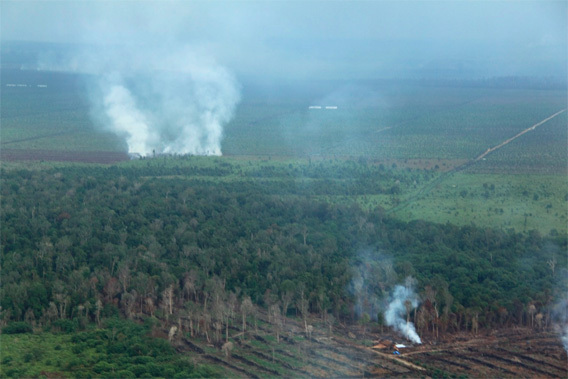 The use of fire for land clearing of peatlands is quite clearly illegal in Indonesia, and the concession owners, the companies themselves, are legally accountable for all such occurrences within their concession areas. However, to date, not one single prosecution as ever been brought against any of the oil palm concessions in Tripa, despite the fact that 707 fire hot spots have been recorded by satellite in these concessions since 2001. Unless action is IMMEDIATELY taken to uphold the numerous national laws that: protect the Leuser Ecosystem; protect deep peatlands from destruction; forbid the use of fire for land clearing; and protect Indonesia’s endangered species, Indonesia’s international promises to reduce its carbon emissions from primary forest and peat land degradation and destruction (REDD) will be confirmed as utterly worthless, bringing international trust in forest and peatland governance within Indonesia to an all-time ‘embarrassing’ low. The most recent publicly accessible cloud-free image of the Tripa peat swamps is a Landsat 7 image from December 26th 2011 (less than 3 months ago; figure 1). This shows that only 12,267 ha of Tripa’s original 60,000 ha of forest cover remains, and that much of what does remain is already fragmented and degraded, by the continual draining of the swamps in surrounding areas. Comparing the above image with satellite imagery from 2009, nearly 5,100 ha of peat land forest have been lost in just 2 years, virtually all of it destroyed by oil palm companies. Today, the largest single block of contiguous forest is only 8,359 ha, with only one other fragment over 1,000 ha. Any Sumatran orangutans trapped in the few remaining small fragments of forest are now effectively refugees, of forest that no longer exists, but are nevertheless also doomed to die a lingering death from to starvation, if they are not killed or captured beforehand. It is now almost certain that less than 200 of Tripa’s former several thousand orangutans are surviving in Tripa, and given the current pace of destruction even their plight is now in immediate jeopardy. It is now extremely likely, unless something can be implemented IMMEDIATELY to halt this tragedy, the surviving orangutan population in the Tripa peat swamps, one of a number of UNEP/UNESCO Great Ape Survival Partnerships’ global priority sites for Great Ape Conservation, will finally be exterminated before the end of 2012. It will have taken just 22 years to exterminate since the first oil palm concession in Tripa was granted to PT Cemerlang Abadi in 1990. Clearly, most fires were recorded on the 24th of March, but based on field reports these fires were all on-going on the 25th March as well, but were probably undetected by the satellites due to heavy cloud cover. By far the bulk of the fire hotspots were in the PT Surya Panen Subur 2 concession (formerly belonging to PT Astra Agro Lestari). PT Surya Panen Subur 2 not only has the largest number and greatest spread of fires, but the area of the fires is also one of the deepest peat areas in the whole of the Tripa peat swamps, estimated to have an average depth of over 4 m (see peat depth sampling points on map). Ironically, all the fire hotspots shown are within the Leuser Ecosystem, since 2008 a National Strategic Area for Environmental Protection. Interim burn scars were measured for the 2 main concentrations of hotspots. The larger burn scar (2,454 ha) lies primarily in the PT Surya Panen Subur 2 concession, while the smaller burn scar (408 ha) is primarily within the PT Dua Perkasa Lestari concession. Six outlying hotspots were excluded from the generation of the burn scars. The total final burn scar from these fires can only really be determined when all the fires have been extinguished, and remote sensing data can be cross-checked in the field. Figure 2: Fire hotspots recorded between 19/3 and 25/3/2012 and projected burn scars, plotted on the remaining peat land forest and oil palm concessions in Tripa. Also shown are peat depth sampling points. All recorded fire hotspots in the Tripa region since 2001 are shown in Figure 3. It is clear that the bulk of the hotspots are clumped into a few particular areas, although the recent fires represent the widest spread of simultaneous fires yet seen. Figure 3: All fires spots recorded in the Tripa region between 2001 and March 26th, 2012. Fire hotspot data collected since the satellites became operational in late 2000 (see table below), clearly show that 2009 was by far the worst year for fires in the Tripa peatlands. However, particularly alarming is that after just 3 months, 2012 is already ranked number two in the annual tally, with 111 fires recorded already. Historically, PT Kallista Alam has the worst record of all the oil palm concessionaires, with nearly 28% of all Tripa’s fire hotspots recorded within their concession, and a peak of 117 fires in 2009. Until this year there were relatively few fires recorded in the PT Surya Panen Subur 2 concession, suggesting a deliberate policy by the company for rapid expansion of conversion at the expense of the remaining peatland forests. The third highest number of fires are in the ex PT Patriot Guna Sakti Abadi (PT PGSA) in Aceh Barat Daya. This concession was never actually formalized, and after the Aceh peace agreement was parcelled out by the local government, purportedly to ex-combatants. It is understood that many of the small parcels have since been bought and consolidated into larger blocks by local government officials and business people. The above ground carbon content of the felled forest areas used for calculations was just 50 t C/ha, less than half the lowest recorded value for the Tripa peat swamp forests (109 t C/ha). A burned peat depth of only 5cm (representing just 20 t C/ha), whilst the depth of peat actually burned in fires is probably much greater. Given the highly conservative values used, and the size of the burn scars, the total amount of carbon lost in just the last several days is considered to be well in excess of 200,000 tonnes, which if valued at US$10 per tonne, represents a loss of over US$ 2 million. Of this loss, over US$1.7 occurred primarily in the PT Surya Panen Subur 2 concession, and nearly US$300,000 primarily in the PT Dua Perkasa Lestari concession. We propose that these figures ought to represent the minimum fines that should be levied on these companies for this illegal burning of peat land. (Reuters) – Forest fires and land clearing by palm oil firms could kill off within weeks about 200 orangutans in a forest in western Indonesia, an environmental group said on Wednesday. The orangutans, part of a population of around 6,600 on Sumatra island, used to live in a lush forest and peatland region called Rawa Tripa on the coast of Indonesia’s Aceh province. But more than two-thirds of the area has been divided up into palm oil concessions, said the Coalition to Save Tripa. Graham Usher, a member of the coalition and a landscape protection specialist, said satellite images showed forest fires had been burning in Tripa since last week, and if allowed to continue they could wipe out orangutans already forced onto the edge of remaining forests. “If there is any prolonged dry spell, which is quite likely, there’s a very good chance that the whole piece of forest and everything in it, so that’s orangutans, sun bears, tigers, and all the other protected species in it, will disappear in a few weeks and will be gone permanently,” he told a news conference. The palm oil industry has expanded to make Indonesia the world’s top producer and exporter of the edible oil, used to make good ranging from cooking oil and biodiesel to biscuits and soap to feed growing Asian consumer demand. Deforestation has threatened animals like the Sumatran tiger and Javan rhino and pushed up carbon dioxide emissions. The Bali tiger and the Java tiger have disappeared in the last 70 years. A two-year moratorium on new permits to clear primary forests came into effect in Indonesia last year, part of a $1 billion deal with Norway to cut emissions and slow expansion of plantations. But the moratorium was breached in Aceh on its first days, an environmental group has said. The last Aceh permit for palm oil was issued by former Aceh governor Irwandi Yusuf in August last year to PT Kallista Alam, prompting environmental group Walhi to file a legal suit against Yusuf. A court verdict is expected next week. “If Kallista Alam win the case they will burn it and that whole bit of forest will disappear and we can say goodbye to the orangutan of Tripa peat swamps,” Usher said. Kallista Alam could not be reached for comment. Picture was taken in Tripa on 10 March 2012, this orangutan was found in a patch of small forest in the middle of palm oil plantation. CRITICALLY-endangered orangutans in a protected area of Indonesia will be wiped out by the end of the year if land clearing is not stopped, a coalition of environmental groups warned today. The government must immediately halt the clearance of forest in the 13,000-hectare peat swamps in Tripa, Aceh province, the groups including Greenpeace and Friends of the Earth said. They also called on the government to investigate the use of fire by palm oil companies for land clearing and reinforce existing laws protecting the ecosystem. Ian Singleton, conservation director of Swiss-based PanEco, one of the groups making up the Coalition for Protection of Tripa Swamp, said the roughly 200 orangutans left in the peat swamps will be gone in months if the fires continue. “The speed of destruction, fires, burning and everything has gone up dramatically in the last few weeks, let alone in the last year, and this is obviously a deliberate drive by these companies to clear all the remaining forests,” he said. Experts believe there are about 50,000 to 60,000 of the two species of orangutans left in the wild, 80 per cent of them in Indonesia and the rest in Malaysia. They are faced with extinction from poaching and the rapid destruction of their forest habitat, driven largely by palm oil and paper plantations. Most of those left are the endangered Bornean orangutan species. And Singleton said that based on 2004 figures there are only 6600 of the critically-endangered Sumatran orangutans left in North Sumatra and Aceh provinces. “We suspect that up to 100 orangutans may have perished in forest clearing and peat burning in the last few months in Tripa,” said Graham Usher of local group Foundation of a Sustainable Ecosystem. Satellite monitoring found at least 87 fire hotspots between March 19 and 24 in three palm oil concessions. Footage and images captured large clouds of white smoke and patches of burnt peat. At least 2800 hectares of peat were destroyed in the latest fires, and the number of animals, including Sumatran orangutans, Malayan sun bears and Sumatran tigers that perished was “immeasurable”, the local group added. Palm oil is a key ingredient in soap and everyday foods ranging from peanut butter to sweets but its cultivation is considered one of the biggest threats to the world’s dwindling rainforests. This link will take you to a collection of photos taken in Tripa, 26 – 27 March 2012, both aerial shot as well as on-the-ground pictures. Fires raging in Tripa peat swamps, wiping out the last bits of forest that is left in the area. Area that was once hold the richest density of sumatran orangutan in the world. If you wished to use the pictures please credit the Photographer Carlos Quilles Menchero. Photos are also available for download here, please use accordingly. Fires are burning in a peat forest that is the center of contentious court case. 77 “hotspots” have been detected in Tripa peat swamp, including fires set in an oil palm concession granted by Aceh Governor Irwandi Yusuf to PT. Kallista Alam last August. The plantation is currently facing a legal challenge by local communities and a coalition of environmental groups known as WAHLI, which contend the concession was granted in an area of protected forest and further violated a moratorium on peatlands conversion. The fires suggest that PT. Kallista Alam is moving ahead with forest clearing despite the legal challenge.WAHLI fears that continued conversion, degradation, and fragmentation of Tripa will drive the ecosystem’s population of orangutans to extinction. Surveys have Tripa has one of the highest densities of critically endangered Sumatran Orangutans.The fires will be the subject of a press conference taking place Wednesday in Jakarta.